A nationwide movement to wear pink shirts in protest of bullying everywhere started when high schoolers in one Canada town passed out pink shirts from the Goodwill and discount stores for seniors to wear in support of a ninth grader who had been bullied for wearing pink. Students in three high schools in San Francisco’s East Bay towns wore skirts on buses and to schools to show solidarity for an agender senior whose skirt had been lit on fire on the bus. But a group of the boys on the Bridgewater Badgers’ football team, where Danny is the official water manager, wouldn’t stand for this. Their solution? A “Danny Appreciation Day,” where they would all imitate Danny’s suave style and proudly go to school. 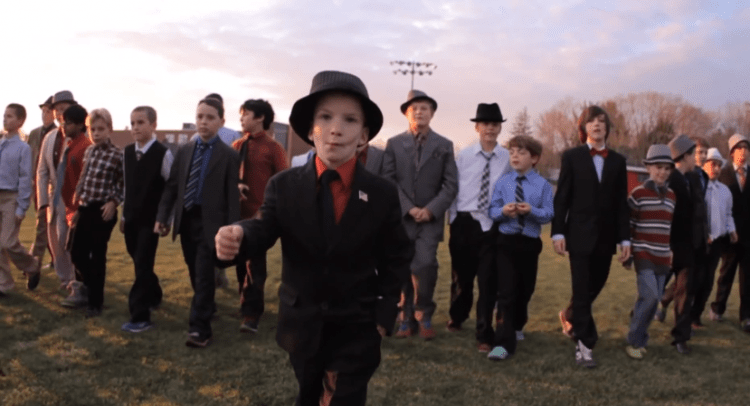 In the Life Is Good video, you can watch scenes from that day — more than 40 boys wore suits. Danny led the march. Kristen Caven is a cartoonist, illustrator (she designed the fabulous OverDressed for Life logo), and author. She recently co-authored the book, The Bullying Antidote: Superpower Your Kids for Life with her mother, Dr. Louise Hart. Thanks for the great post, Kristen. Thank you for sharing, Moya!